The LG Thrill 4G, AT&T's next (hopefully) Android smartphone has once again been delayed, this time the date is pushed back until September 4. As mentioned in the document you see above, the Thrill was to ship to third party stores (in this case, Radio Shack) on August 21, but that's not going to be happening. We have no idea why the phone keeps being delayed, but it's something we're used to by now. 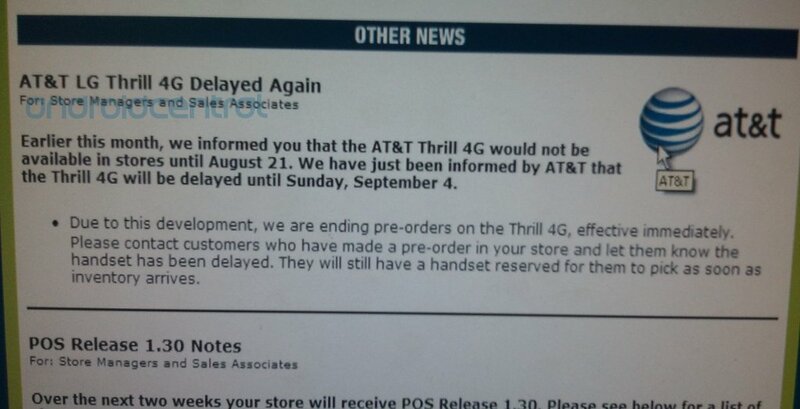 There's also the small matter that AT&T never announced a release date, only "this Summer". It will be released when it's ready. Hopefully the extra time means a better product out the door.